Great for everyone from young singles and couples to families. This large complex of modern‚ Moorish-style apartments offers a vast range of facilities‚ daytime sporting activities and evening entertainment. Stayed here February 2013, we really enjoyed our stay as the staff were hardworking and very friendly and helpful. The hotel was clean throughout and we had clean bedding and towels every day. It was well located not far from the beach. Sometimes the food was repeated but there was an enormous choice suiting both young and old. If I had to nit-pick and find fault here it would be that the water in the pools was so cold no one used them also could have done with larger bath towels. Entertainment wasn't great but we didn't stay in much anyway. A little tip book your trips with Ticket Box across the street much better bargains. Hotel room was really nice to start off with, can’t say I liked the hotel at all. The hotel was overrun by large groups of lads causing mayhem, leaving food and drinks all over the pool area. There were not enough seats in bar in evenings as all the lads would take over, there was no entertainment what so ever. One drink at a time even if there was only two of us so we had to get up one as a time to get a drink. Food not nice at all same meal every night of chips, beef stew, pizza, the meals didn’t change the whole week we stayed there. This is with out doubt the best 'complex' we have stayed at. The room was small but very functional and clean (2 berth), the food was very hot and well cooked with plenty of variety (bacon was not soggy) and drink was plentiful. stayed in this hotel for onw week on self catering basis.the hotel location was good not far from the shops and restaraunts.we found the hotel staff very ignorant they need to smile more.only used enterainment room twice and both times it was rubbish kids and us adults was bored so we didnt use it a third time.we found the hotel very dirty we had to clean the rooms ourselves before we could un pack the floors got swept and mopped once in a week they only gave us 2 towels between four of us so we asked for more but these took a day to arrive. this holiday was sold to us as a family holiday. it wasnt worth the money it was a waste of time going all inclusive there were plenty of pubs and shops to get food from the cleaners came in every day we had to get a room change the day after we got there the room was very dissapointing the next room was a little bit better sleeping arrangements were a couch where an adult was surposed to sleep but its to small for an adult and a camp bed sp in the end my young son slept on the couch and i on the camp bed my husband and daghter in the other room on what i would call camp beds if only the beds were better.hotel staff were nice and pleasant the food wasnt very good my family were ill with sickness and the runs from the wednesday onwards it could have been the food the location is in the centre with busses outside a taxi rank further round and the hospital just further up so traffic noise sirens going all times of the night and the hotel echoed there would be people shouting to each otherin the hallways screaming singing and even fighting and security doing nothing to stop them.we went on holiday first time abroad for my children it was a disaster never again the hotel is more for couples and young lads and lasses who want to go out and go to pubs and go clubbing it sounds good but not for young families. we stayed at this hotel for 2 weeks. It was fairly clean although the rooms had the towels changed everyday we only had the beds changed once and the floors in the hotel room weren't moped and the balcony area was swept occasionally. We were only staying in a studio but there was enough room and had all we needed for the stay and only really used it to sleep and sometimes have lunch. The rooms did get warm due to not having any air conditioning. The room we had as facing on to the man road and did get noisy at times hearing all the sirens and people returning early hours of the morning from the clubs although did get used to this as the holiday progressed. Not enough sun beds around the pool area as people were always up early nd putting towels on the beds to reserve them although it was a mainly English hotel. ALthough we went self catering we did pay once on our second week for the all you can eat buffet on an evening to see what it was like. There was alot of choice but as we only tryied it once dont know if it is the same food al the time. There was a variety from salad, soup, pizza, pasta, meat, veg and also lots of deserts, cake, fruit, icecream etc. The hotel wasn't far from the beach and while we were there we went to los christianos beach about a 20 min walk from the hotel as it had lockers to keep all the valubles safe and toilets. The hotel staff were poliet but on the odd occassion the reception staff tryed to ignore you. They also wouldn't keep te room key when we went out on day trips which was annoying at times just incase it got lost. The entertainment was good but as wewere there the 2 weeks it just got repeated the 2nd week but just in a different order. You got the usual shows like animals (parrots, egales and snakes) and brazilian dances and also karaoke. Before these shows they had a kids mini disco and bingo to win alcohol. All in all the hotel was good but i just think i would try another area to go and relax as this one wasn't in the main resort but as it was cheap all the clubbers go to it. Arrived back from staying at the columbus for 9 days AI..Iwould not recomend the AI iam not a fussy person but it is a total joke, i believe you get what you pay for but here you don't.There is not much choice of food at all and all repetative, the quality of food was average nothing to rave about..Drinks not a wide choice and you can only get them from one bar down side of a tunnel which is closed between 1pm & 3pm, you can go and get them from the restraunt between these times which means heading to reception down the stairs no more than one drink per person.We didnt see any day time activities at all,night time they had shows on didn't stay to see any as went out at night and so did a lot more people that was AI so what does that tell you. The pool is large and looks lovely but doesn't get any sun around it and only saw a handfull of people in it in the whole nine days.The best place to sunbathe is up the stairs on the terrace.The hotel staff most were friendly.The rooms very basic and ineed of refurbishing..cleanliness of rooms were quite poor floors mopped once in 9 days, towels changed daily and bedding twice in our stay bath not cleaned out very often.I would not recomend this hotel at all it is a let down and is nowhere near a 3*. 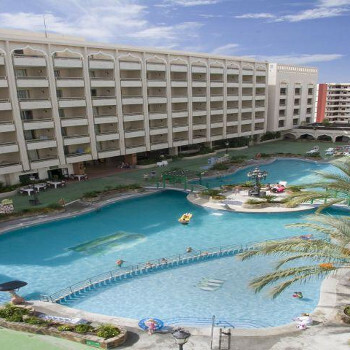 This was an ideal hotel for 7 young men on a lads holiday , we upgraded to all inclusive to get the full benefits before going out at night , the hotel was clean and tidy , rooms cleaned daily . the food was ok , i have had worse . the location of the hotel is pretty good with veronica's a 5 min walk away. The hotel staff werent the friendliest but we were 7 english men partying so i think they coped well. after reading some of the comments about this hotel we were a bit apprehensive about staying here.there was 2 families we had 2 1 bedroomed appartments. we have just come back from a weeks holiday at this hotel,had a brilliant time,all the staff were very helpful especially our maid,nothing was too much bother for her.rooms were cleaned every day.swimming pools were lovely all lit up at night time.we went out every night as there was so much choice so cant comment on the night time entertainment in the hotel.during the day there was always some game going on if you wanted to join in,my son and nephew played all the games and really enjoyed themselves football,table tennis,pool etc,there was no pressure to join in.the cheapest supermarket was just round the corner called hyper-dino up above the spar it had everything you would need.the weather was red hot.i would definately go back. We travelled to this hotel in August, not having been to Tenerife before. The Columbus apartments look quite old school style when you first arrive which did put me off slightly but i was pleasently surprised when we got in there. The rooms are quite basic but the cleaners gave you clean towels every day and made your beds and even washed up!! - the only thing i did notice was that the floor was never swept so it was a bit grubby by the time we left! But it wasnt a big deal. The pool area is nice and clean with a big pool. They lock the sunbeds up at night and open them at about half 9ish, which i thought was a good idea as there was always sunbeds free later on in the morning as people werent reserving them with towels! The hotel is in a nice location, as it is out of the way of the veronicas strip but within close walking distance. The only thing i did find was that it was a bit noisy at night times, we only had a couple of late nights, so when your in bed at midnight you notice the noise more! We went self catering so not sure what the food is like. But i did over hear a chavvy family complaining about the food being awful, but then again we spoke to another family who said the food was lovely. I think you get what you pay for really. We walked to Los Christianos beach as the beaches around Las Americas were dark sand. The walk from this hotel is about 20 mins which is tiring in the heat but worth it. Loro Parque is a good attraction to go to. Its nice to do something other then sunbathe or go to the beach. We did find that it was quite busy, especially around the times of the dolphin and whale shows. Make sure you get to the dolphin show early, at least half an hour before, as they fill up really quickly! !